Allium tricoccum, commonly known as ramps, spring onion, ramson, wild leek, or ail des bois (French), is a member of the onion family (Alliaceae). Found in groups with broad, smooth, light green leaves, often with deep purple or burgundy tints on the lower stems and a scallion-like bulb strongly rooted just beneath the surface of the soil. Both the white lower leaf stalks and the broad green leaves are edible. They are found from the U.S. state of South Carolina to Canada and are especially popular in the cuisine of the US state of West Virginia and the Canadian province of Quebec when they emerge in the springtime. A common description of the flavor is like a combination of onions and strong garlic. In central Appalachia, ramps are most commonly fried with potatoes in bacon grease or scrambled with eggs and served with bacon, pinto beans, and cornbread. 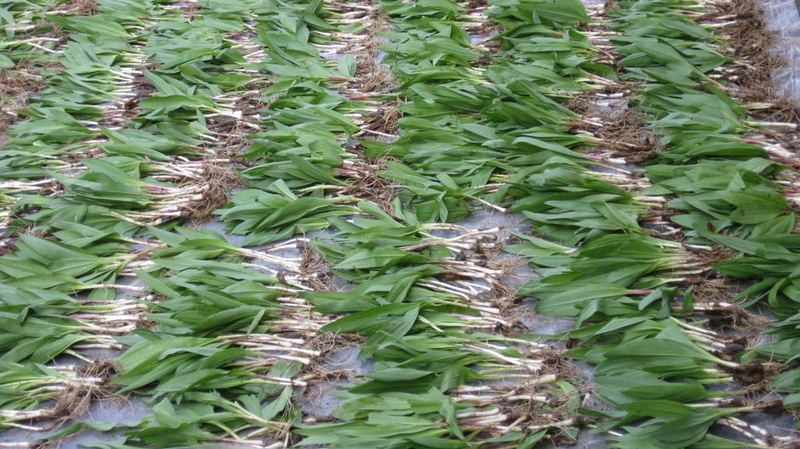 Ramps, however, are quite adaptable to almost any food style and can also be used in soups, puddings, ketchup, guacamole and other foods, in place of onions and garlic. 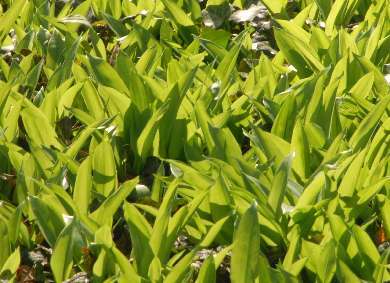 The community of Richwood, West Virginia, holds the annual "Feast of the Ramson" in April. Sponsored by the National Ramp Association, the "Ramp Feed" (as it is locally known) brings thousands of ramp aficionados from considerable distances to sample foods featuring the plant. During the ramp season (late winter through early spring), restaurants in the town serve a wide variety of foods containing wild leeks. The city of Elkins, West Virginia, hosts the "International Ramp Festival" during the last weekend in April of each year. This festival features a cook-off and ramp eating contests, and is attended by several hundred people each year. The community of Whitetop, Virginia, holds its annual ramp festival the third weekend in May. It is sponsored by the Mount Rogers volunteer fire department and features local old time music from Wayne Henderson and other bands and a barbecued chicken feast complete with fried potatoes and ramps and local green beans. A ramp-eating contest is held for children through adults. In Bradford, Pennsylvania, on the first Saturday in May, is an annual event called "Stinkfest." Local food vendors, providing Chinese, German, Italian, and traditional American cuisine, offer their dishes with ramps included. Highlights include the dip tasting contest, the outhouse races (where teams from local business build rolling outhouses and power them down the main thoroughfare), and appearances by local musical groups. The 8th Annual Stinkfest will be held on May 2, 2009. In Canada, wild leeks are considered rare delicacies. Since the growth of leeks is not as widespread as in West Virginia and because of destructive human practices, wild leeks are a threatened species in Quebec. In Canada, wild leeks are considered rare delicacies. Since the growth of leeks is not as widespread as in Appalachia and because of destructive human practices, wild leeks are a threatened species in Quebec. Growing in its natural woodland environment. Allium tricoccum is a protected species under Quebec legislation. 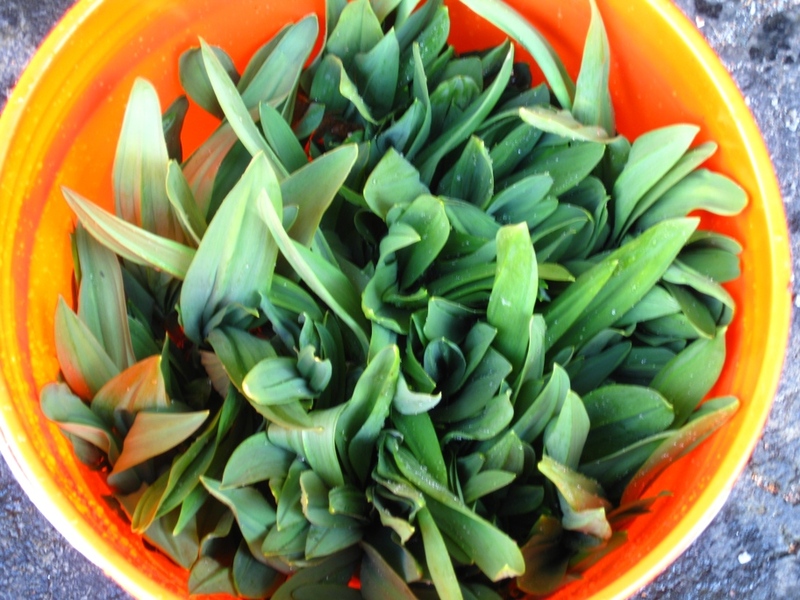 A person may have wild leek in his or her possession outside its natural environment or may harvest it for the purposes of personal consumption in an annual quantity not exceeding 200 grams of any of its parts or a maximum of 50 bulbs or 50 plants, provided that those activities do not take place in a park within the meaning of the parks act. The protected status also prohibits any commercial transactions of wild leeks; this prevents restaurants from serving wild leeks as is done in the United States. Failure to comply with these laws is punishable by a fine. However, the law does not always stop poachers, who find a ready market across the border in Ontario (especially in the Ottawa area), where wild leeks may be legally harvested and sold. The name of the U.S. city Chicago is said to originate from "Checagou" (Chick-Ah-Goo-Ah) or "Checaguar," which in the Potawatomi language means "wild onions" or "skunk." The area may have been so named because of the smell of rotting marshland wild leeks (ramps) that used to cover it. 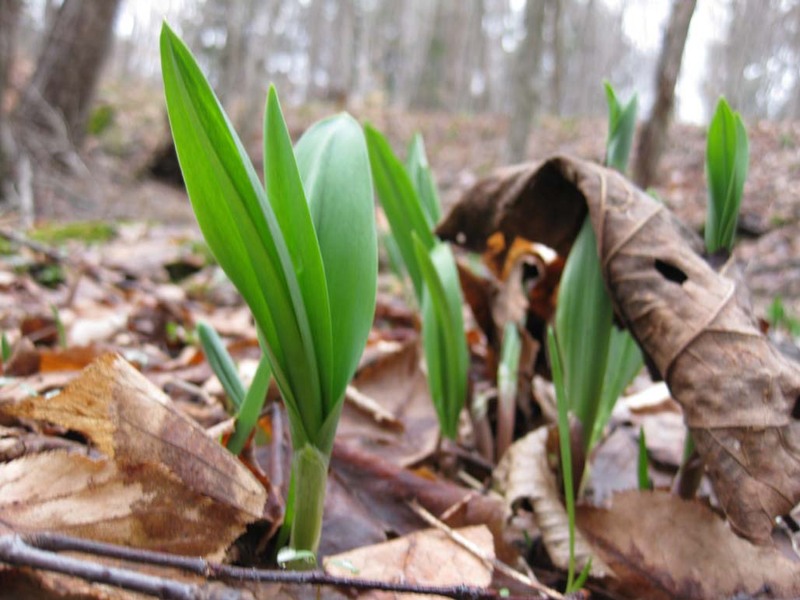 The appearance of ramps in the spring is often used as an indicator to morel mushroom hunters in the Mid-West, much of the South and a few states in the eastern corridor to determine when the mushrooms will begin to appear. The size of the ramp is taken into consideration by morel hunters to measure the length of time before the mushroom season begins. English ramson (Old English hramsan) is of unclear origin; cognates are found in several Germanic (e.g., Swedish ramslök and regional German Ramsen) and Slavonic languages (e.g., Serbian cremoš and Russian cheremsha). There are, however, a few possibly related words in other Indo-European tongues: Greek krommyon and Sanskrit krimighna onion , and maybe Welsh craf garlic . A possible Proto-Indo-European root behind is KREM. Romanian leurda also belongs to that series, being com­posed of an element (a)le- garlic (from Latin allium) and a second element -urda related to Modern Romanian urs bear . Bulgarian levurda was borrowed from Romanian. I do not know what the associations with bears are motivated by; allegedly, there is common belief that bears, after having ended their winter sleep in spring, first feed on bear’s garlic. The name bear is common to all Germanic tongues (Old English bera, Old Norse bjorn); in contemporary languages, we have for example German Bär, Dutch beer or Swedish björn. The name is a euphemism originally signifying just the brown one , being derived from an Proto-Indo-European root BER brown ; an alternative, yet less plausible, explanation relates bear to Greek ther animal and Latin ferus wild (Proto-Indo-European WER- beast ). It appears that the Germanic peoples avoided uttering the true name of the bear, fearing that the invocation of the name might make the dangerous animal appear. A similar taboo concept lies behind Russian medved and its Slavonic cognates with the literal meaning honey-eater . Russian med honey has relatives in almost any Indo-European language. In the Germanic languages, we find almost identical words for honey-wine : English mead (Old English meodu or medu), German Met and Icelandic mjöðr, all go back to Common Germanic MEDUZ. Non-Germanic examples include Latvian medus honey , Sanskrit madhu sweet and Old Greek methy (honey)wine , which lies behind the name of a wine-coloured semi-precious stone, amethyst. All these correspond to an Proto-Indo-European root MEDU meaning sweet; honey (see also licorice and almond for more sweet words). Interestingly, this root also appears in Proto-Finno-Ugric as METE, hinting at an extremely early contact between these two language families. Mead played a dominant rôle in ancient Germanic culture. The beverage is mentioned in the very first song of the Poetic Edda, völuspá, as being drunk by the all-wise giant Mimir: dreccr miöð Mímir morgin hverian Mimir each morning his mead drinks . Germanic peoples of historical time were well known for their large consume of mead; Northern Germanic (Viking) kings had their throne typically in a large wooden mead-hall. Cf. also the multiple occurrences of mead in the Beowulf poem, and the name of Beowulf’s own hall, meduseld mead-hall . The name Beowulf itself literally means bee-wolf and thus bear ; the reference is that bears often steal honey from beehives. The true Proto-Indo-European name of the bear is H2RTOS, probably meaning destroyer ; it appears in Latin ursus, Persian khers Sanskrit riksha and Greek arktos bear ; the latter term was also used to denote the constellation Great Bear (also known as the Great Dipper) and thus became a general term for north . 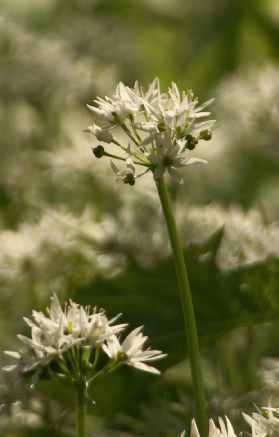 Many languages have a name for bear’s garlic signifying wild garlic : French ail sauvage, Greek agrio skordo, Russian dikij chesnok, Hebrew shum habar and Turkish yabanî sarimsak may serve as examples. Cf. 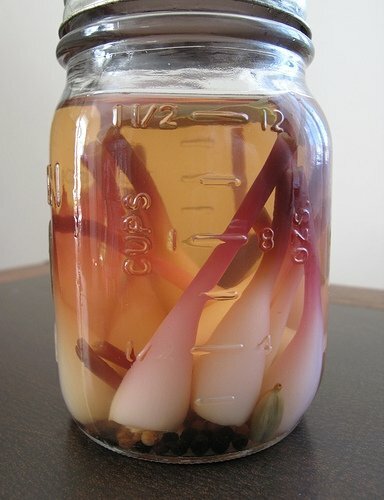 also Chinese ye cong wild onion . Another, less common, denomination is garlic of the forest : Dutch woutknooploock, yiddisch valdknobl and Spanish ajo silvestre. Quite confusingly, the Bulgarian name div chesun wild garlic does not mean bear’s garlic but chives. Ramps appear quite often on the Food Network show, Iron Chef America, used by Iron Chefs and challengers alike. Ramps were a mystery ingredient in the main course round in the "Buckwheat Blunders and Twists of Fate" episode of the Food Network show, Chopped. The protagonist of JT LeRoy's novel Sarah encounters ramps for the first time at a truck stop in the wilds of West Virginia, and eating them becomes a rite of passage. For further information see Wikipedia's article on ramps, where much of this content originated, For further information on European bear garlic see Gernot Katzers Spice Pages.